Julissa Hunte, arguing on behalf of the school district, pressed the judges to consider that they had been inclusive of the coach, offering him multiple ways to practice his personal beliefs without doing so as a public representative of the school. 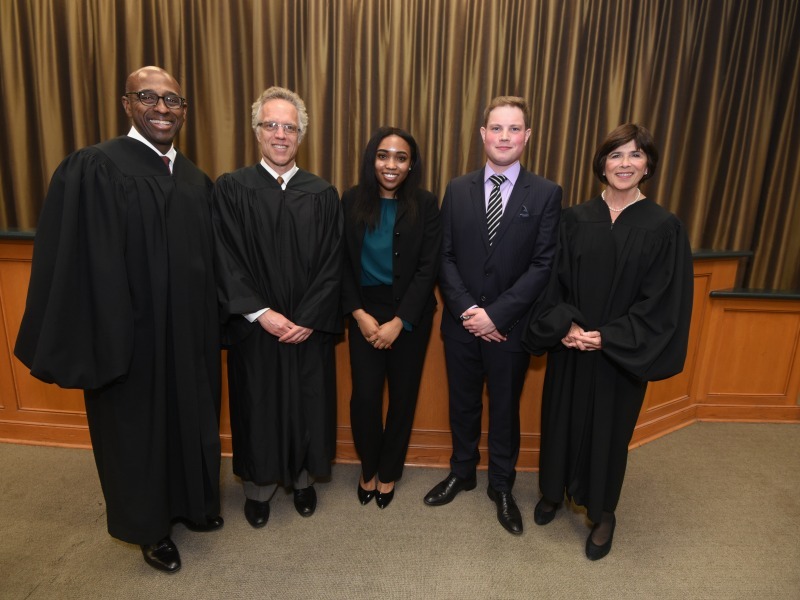 The two themes stood as the core of the case Kennedy v. Bremerton School District, representing the final Moot Court Honorary Round held Jan. 28 at Tulane Law School. In the end, a three-judge panel representing the Supreme Court named Hunte as the ‘best orator,” celebrating her ability to “take body blows” in the form of tough questions from a panel of three seasoned, distinguished federal judges and arguing with an “air of confidence” that belies more experienced litigators. Her name will appear first on the large marble slabs at the back of the Wendell H. Gauthier Appellate Moot Court Room, alongside Trytten and six others who all won early rounds in various areas of competition. The judges lavished praise on both third-year law students, calling them tough competitors performing at a level they had not witnessed in the many moot court competitions they are often asked to preside over. The other two members of the panel, Judge Joseph Anthony Greenaway of the U.S. Court of Appeals for the Third Circuit; and Judge Yvette Kane (L'76) of the U.S. District Court for the Middle District of Pennsylvania, echoed Higginson’s praise following the argument. In Trytten, the judges lauded his ability to think through the many multi-point questions, and answer them cohesively, even expertly. They said he masterfully wove a theme throughout his arguments that “teachers are people, too,” and have a right to be pious and hold personal religious beliefs. The moment brought laughter to the room full of fellow students, faculty, staff and law alumni who had come to see the once-a-year final round. Among them were alumni who have helped strengthen the moot court tradition with a recent infusion of gifts dedicated to growing the program, and generate more interest from students to compete. Last year, those donations – launched with a lead gift from trial lawyer Evan Trestman (L ’77) -- helped revamp the program, and it played out in the spring to a packed house before a distinguished panel of federal judges. Subsequently, alumni and partners with the firm Herman, Herman & Katz enhanced the program by endowing the Harry Herman Moot Court Excellence Fund to support moot court and the trial and appellate advocacy program. Maury Herman (L ’68), a partner with the firm whose own name is engraved on the marble from his student moot court days, attended the argument and praised the students’ performance. The moot court program now has 53 students in competitions throughout the year. Earlier in the day, Judges Greenaway and Kane met with a group of about 35 students over lunch to discuss judicial clerking and career advice. Greenaway returned to campus the next morning to guest lecture to a class taught by Professor Kristin Johnson, one of his former law clerks. Trytten and Hunte have exceptional skills and experience in appellate advocacy. He is a coach for the Criminal Court appellate moot court team, she works with the Black Law Student Association and coaches the Moot Court team that will take part in the PACE Environmental Law Moot Court competition coming in February.